The news on Troy Davis is very bad. Despite being innocent, the Georgia Parole Board has OK'd his execution for 7 PM tomorrow (September 21st). Yet the fight to free Troy Davis isn?t over, and if that fails, the fight to overthrow the evil system that murders him will continue. 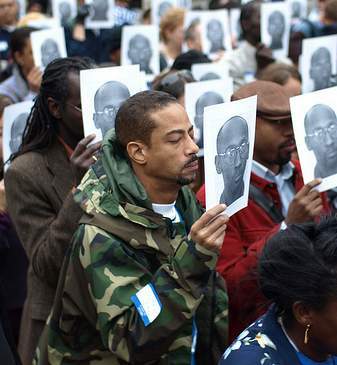 Troy Davis was sentenced to death in 1991 for the killing of an off-duty Savannah policeman. Davis was found ?guilty? based on dubious accounts that he confessed to the killing and questionable ?eyewitness? identifications that included false eyewitness testimony coerced by the cops. Seven of the prosecution?s nine ?eyewitnesses? have since recanted. The only holdouts are one man who may be the actual killer and another who initially denied being able to identify the shooter only to pin it on Davis two years later. Three of the eyewitnesses say their testimony was coerced by the police. New eyewitnesses have come forth identifying another suspect. The news on Troy Davis is very bad. Despite being innocent, the Georgia Parole Board has OK'd his execution for 7 PM tomorrow (September 21st). Yet the fight to free Troy Davis isn�t over, and if that fails, the fight to overthrow the evil system that murders him will continue. Troy Davis�s sister, Kim Davis, has started a new petition to have the Georgia Parole Board overturn their decision. Protests will also be held in a number of places. One called by Black leaders in L.A. states in their press release, �Echoes of slavery, Jim Crow, Klan lynchings, racist police murders and economic injustice are now heard reverberating in the cell of Troy Davis. So must our rage.� They will be gathering to rally at Leimert Park in Los Angeles (at Crenshaw & Vernon) today (Tuesday, September 20th). I am also posting a resolution passed by International Longshore and Warehouseman�s Union (ILWU) in favor of Troy Davis. It would be nice if they would act on this and shut down the ports to stop the execution. Having that kind of fighting labor movement and a bigger socialist movement to help lead it in that direction would hit the capitalists who rule America much harder than strategies of petitions and protests. We do what we can to build in that direction. Therefore Be It Resolved that the ILWU reaffirms our opposition to the death penalty, supports Martina Correia�s lawsuit and demands freedom for these victims of government repression, just as we did for Tom Mooney and the Scottsboro Boys in the wake of the Big Strike of �34, on this the 75th anniversary of that momentous struggle.